When I started looking for another car I had a few criteria. I had been driving a loaded 2006 Audi A4 Quattro but wanted a little larger car. It needed to be domestic, AWD, lots of creature comforts and a full size sedan. I did not want an SUV. After spending time looking at GM and Ford, no Chrysler, I had settled on the MKS and we were trying to find the right one. Then for grins I drove the SHO, and the rest, as they say, is history...! 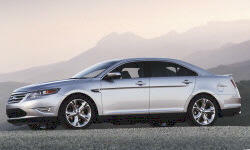 Why the 2011 Ford Taurus? I was struck by the exterior styling of the Taurus SHO when I first saw the car. My wife and I had been looking at the Lincoln MKS and had driven several. We both liked the Lincoln interior, ride and features, but she had mentioned several times how she liked the looks of the Taurus front end in particular. Well, just to see what a Taurus was like vs. an MKS, I found one on a Saturday morning surfing the web, called the dealer and arranged to drive it. When we got there we were greeted with this beautiful black SHO. We drove it and I fell in love. I love the exterior, the interior and all of the features. The car is awesome! I am very impressed with the interior design. We have a black car with the SHO black interior and it is sweet. The seats are firm, supportive and yet extremely comfortable, very adjustable and a pure pleasure to sit in. I like the ambient lighting, the SYNC, Sony audio and Nav. The controls are laid out well, make sense and my wife can use them. She is not techy and yet everything makes sense to her. One of the things that impresses me about my SHO is the amount of safety features on the car. I wanted the adaptive cruise because I thought it might lower my blood pressure on daily 80 mile round trip highway commute. Well the car also has a collision avoidance feature to prep the brakes if someone in front of you brakes suddenly, and it warns you about that. It also has the BLIS system, Cross Traffic Alert and the backup camera. Throw in all of the air bags, smart belt tensioners and I feel very safe in this car. What can I say? I have not even begun the test the power of this engine! And when I do I'm going to want a big straight piece of road to do it on! The engine is smooth, quiet and very responsive. You wouldn't know it is twin turbo, there is no lag. The car is extremely (almost Lincoln) quiet, except on rough road. I believe a good portion of that is the tires, yet they have a lot of life left on them so I will not be replacing them right away. Why Not the 2011 Ford Taurus? My average MPG is about 24 right now. It does better on the highway and not as well around town. I do not drive it hard. I am using (per Ford) Regular 87 in it and it seems fine. I ran one tank of 93 Premium and did not notice a difference in performance or mileage. No major issues. A commanding view out the front. A little harder to see over your shoulder to the sides with this car but the mirrors are good and the backup camera very useful. I am very pleased with these systems. Not sure why the SYNC gets such a bad rap. It ain't perfect but find me one that is. The entire SYNC, audio and nav system is very cool and very useful. I keep finding new features every day! While there is a fair amount of plastic in the interior of this car, it is well done and looks good. For the price I have a very nice car with features, comfort AND performance that make it competitive with the European stuff. I traded a 2006 A4 for this and don't miss it a bit. It is July 2013 and I bought my car last month. It is the first Ford I have owned since 1982, when I traded in a '69 Galaxy for a '79 Horizon. Wish I still had the Galaxy! I grew up in a Ford family, had my diver's license since 1974 and driven a bunch of different cars but had primarily been a GM for the last 20 years. They're still doing nice stuff and I've driven some of it but this Ford stole my heart and I'm glad to be back in the fold. Both Ford and GM have had their political and social miscues the last few years but I think Ford's product speaks for itself and I'm glad I own one.